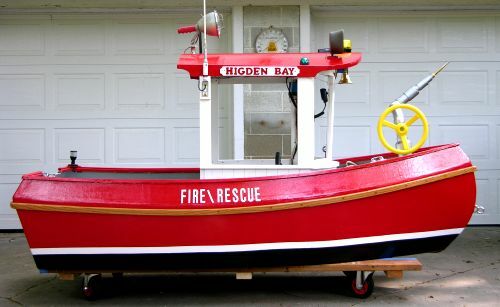 Here is a picture of Tubby Tug as a Fireboat, the "Higden Bay". It will operate out of Higden on Greer's Ferry Lake Arkansas. Built for my Grandchildren ages 6 & 10. Boat is equipped with compass, radio, bell, air horns, siren, CB radio, hailer, navigation, emergency, and searchlight. The pump is a Sure-Flo Extreme washdown. The Monitor is constructed of PVC pipe. Power is a 5 HP Briggs & Stratton.